Clezil Clementino (middle) goes for the winner with a header, assisted by Vinícius Lopes (right), while Hugo Albuquerque (left) tries to defend. Pinheiro is trying to get a Brazilian game called footvolley off the ground in Canada. Footvolley is a game that combines soccer and beach volleyball. Players use their feet, shoulders, chests and heads to move the ball. They cannot use their hands or arms. They play in pairs and follow a unique set of rules. The sport took off in Brazil years ago. “If you think about, it’s a healthy style. [The game] is very democratic, not expensive at all. The beach is free. All you have to do is take your net, put it up, and ask for two or three friends to join and you can play. This simplicity is what really motivated me,” said Pinheiro. Even before he moved, Pinheiro reached out to fellow Brazilians through Facebook. He found a kindred spirit in Winderson Rocha, a Brazilian immigrant who lives in Surrey. In 2016, Rocha created Vancouver Footvolley, a website designed to recruit players and introduce newcomers to the sport. As of last month, it is a registered trademark. The two of them lived on the beaches at English Bay and Kits last summer and, according to Rocha, they got a lot of attention. “You should see their faces, people were startled. It is a great game to play and watch. The beauty of footvolley is that we are often in acrobatic positions and many people can’t stop staring,” said Rocha. Footvolley is slowly spreading around the globe. The Washington Post even hailed it as the coolest sport not included at Rio 2016. Last year, a Granby, Que., native and former footballer, Jocelyn Roy, represented Canada alongside Canadian-Brazilian Tony Menezes in the Rio 2016 Footvolley World Tournament, the biggest international competition ever. The duo finished 18th out of the 24 teams. So after a summer playing on the beaches, drawing between 10 and 25 people to play regularly, they realized it was time to move inside. 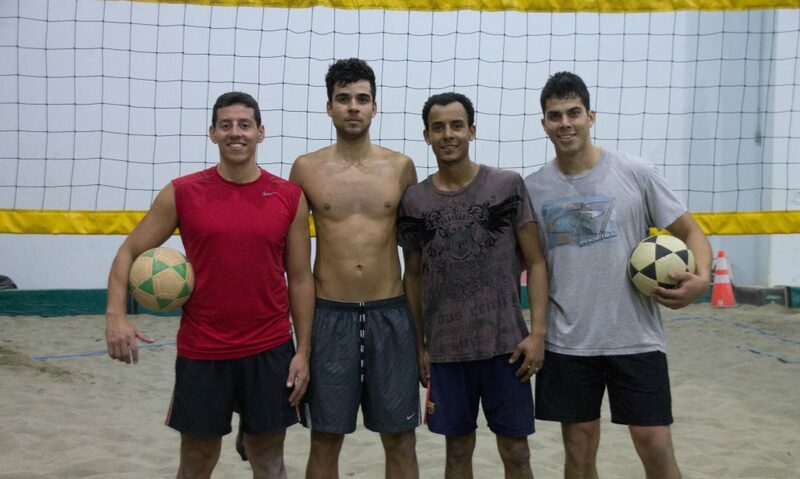 Pinheiro and Rocha and two other Brazilian ex-pats spend $580 per month to play a couple of times each week at 6Pack Indoor Beach in Richmond. For now the focus is recruiting new players. “The natural path of footvolley is to draw players who play or played soccer. Sometimes former volleyball players join, but it is less common. So this is where we are aiming at,” Pinheiro explained. 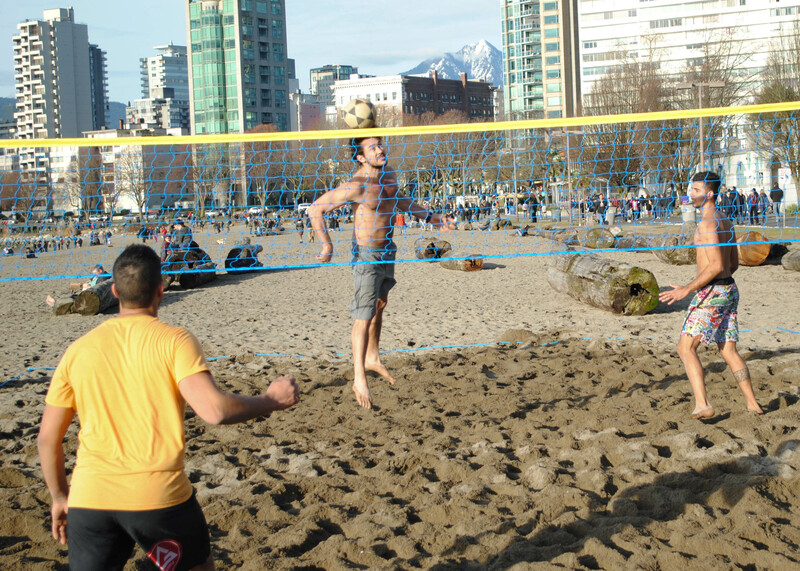 Not even a cold Sunday in February could stop Samuel Pinheiro (left) and Vinícius Lopes (right) from playing at English Bay. Good strategy, since Vancouver is known as — in the words of Vancouver Whitecaps president Bob Lenarduzzi — the soccer capital of Canada. In an eight-day span in 2016, BC Place put 100,000 fans in seats. Those, 54,000 witnessed a men’s national team match. Pinheiro believes he can recruit players by telling them about how much fun the game is and also how few injuries there are in footvolley compared to soccer. Ultimately, he hopes to create a footvolley league within a couple of years. There is evidence for optimism. Ivan Guimarães is a sports marketing strategist who has helped grow the game in two cities already. He started in São Paulo, Brazil, the country’s biggest metropolis. He started in 1994 and it wasn’t long before he got others involved. São Paulo is known for many things, but not for beaches and not for beach games. Guimarães started playing in clubs and eventually grew the game, creating leagues and, local tournaments. In turn, the clubs built footvolley courts. He estimates São Paulo has 1,500 active players. In 2014, Guimarães moved to Miami, Fla., and he got to work. He already has a footvolley school with approximately 90 players enrolled. “When I moved, [footvolley] was already happening here, but it was an isolated scene. A group of Brazilians played in South Beach, another group in Coconut Grove and another in Sunny Isles. I came in February 2014 and, by the following April, I was gathering those groups and organizing tournaments,” he recalled. He’s helped organize tournaments in California, Florida and Maryland. Those tournaments led to the National Footvolley Association which was founded to promote the sport across America. The association now has directors in California, Washington, D.C., Florida, Georgia, Illinois, Indiana, New York, Texas, Wisconsin and into the Midwest. Guimarães is not done yet. His next challenge is to professionalize. “With each tournament, more sponsors come, but rewarding athletes with a living wage is still in the works, maybe in two years from now if we get more investment,” he said. Guimarães has learned a lot about what it takes to grow the game. Freddy Moojen is a devotee. The Montreal-based Brazilian-Canadian professional soccer player for the CS Mont-Royal Outremont of the Première League de soccer du Québec has been playing for 25 years. He represented Canada in footvolley international competitions in France and Tunisia. That spirit of fun is what Pinheiro wants to share. “It’s a long road. The game needs to be known first, then grown, which is what are trying to do, but we are at our baby steps. We cannot think about a league right now,” he said. 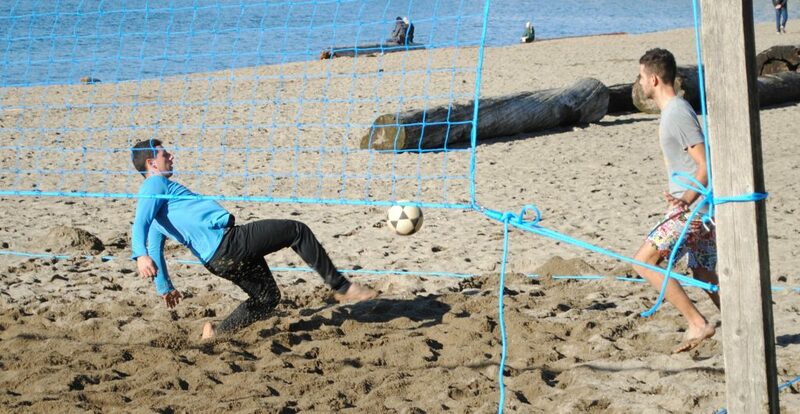 Vancouver Footvolley. Left to right: Samuel Pinheiro, Vinícius Lopes, Winderson Rocha and Hugo Albuquerque. The Vancouver group is excited for summer. The possibility of going to the beach, introducing the sport, getting players and making footvolley part of their lives are what motivates them. The boys are planning to be on the beach wearing their Canada Footvolley shirts every day from 3 p.m. until sunset. “It will give us a sense of unity, that we are together in this journey that we are very optimistic about,” said Pinheiro.